"My work has always involved light and shadow, color and movement." Anne Healy is a sculptor based in New York whose early work featured large outdoor sculptures sensitive to changes in light, wind, and other aspects of their environment. Two to One, completed in 1968, featured four triangles, including one made from negative space, attached at their points, formed via two strips of red sailcloth and one strip of blue. The piece hung off a building and attached to a sidewalk, displaying Healy’s tendencies towards manipulation of scale and visual configurations to create a variety of shapes that respond to the world around them. For a time, her emphasis on cloth as the material base for these sculptures aroused suspicion in critics, who considered the material too ordinary and traditionally feminine to truly be considered art. 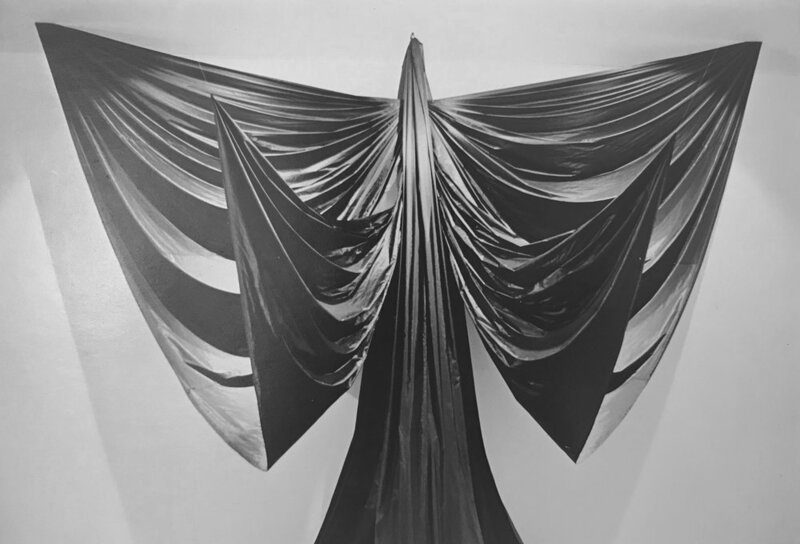 In retrospect, these early cloth sculptures and other installations the artist would make throughout her career tackle themes of immanence, the malleability of modern day materials, and the articulation of art in public spaces with a level of sophistication equivalent to her male counterparts. Additionally, due to her focus on the dynamism of natural environments, many consider her work to have much in common with Land Art in its formative years. Anne Healy’s work is representative of a period during which feminist art practices first clashed with formal discourses on art, and has facilitated the bridging of two formerly disparate worlds. Anne Healy received a BA from Queens College, majoring in English Literature and Theater and minoring in Art History and Philosophy. She initially became involved in the feminist arts movement through consciousness raising groups in the late 60s, and around the same time met Barbara Zucker through a shared interest in theater, eventually leading to an invitation to join A.I.R. As a member of the gallery, Healy challenge herself to work within the more static confines of indoor spaces, making works such as Hectate, a ceiling to floor cloth sculpture that utilized a hidden aluminum structure to provide shape in the absence of natural agents of change. Healy has been commissioned frequently for public works projects by such establishments as the New York Cultural Center, Saint Peter’s Church in New York, and by the city of Pittsburgh, Pennsylvania, amongst others. Her honors include a Sculpture Award from the American Association of University Women, a Sculpture award from the American Academy and Institute of Arts and Letters, and three travel grants from the University of California at Berkley in 1983, 1987 and 1995.